Mercedes don’t make it easy to “borrow” their cable runs that go from the van body into the doors. We wanted to put power cables through into the rear doors for powerful work lights. It was more effort than it should have been. 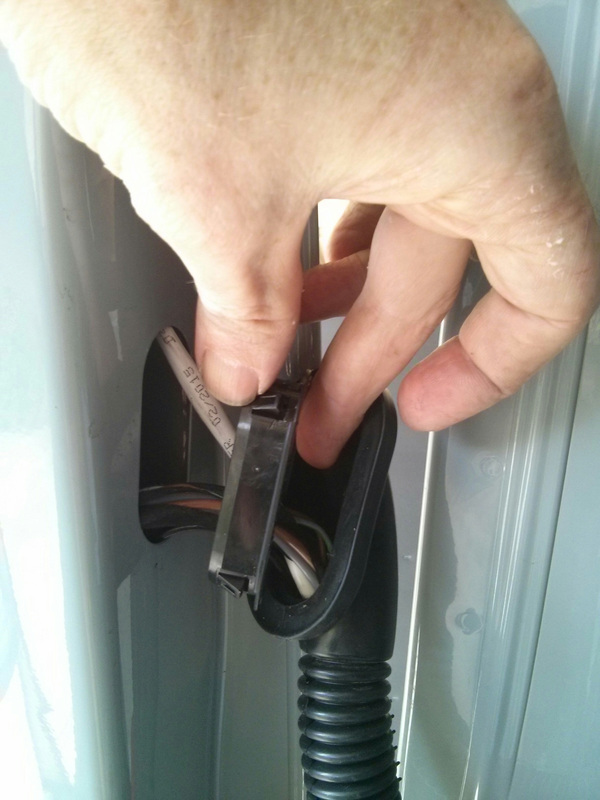 The trick is to first pull off the flexible rubber hose, then pop the plastic piece out using trim tools. It has clips at its corners. Once you’ve run the cable through (use a wire fish – there’s a tight grommet seal inside the rubber hose), re-attach the rubber hose to the plastic piece, then just snap it back in place. It was worth it though. Now we have LED lights in the rear doors. They each switch on independently. They are really bright for working inside the van, but we designed them more for outside use. 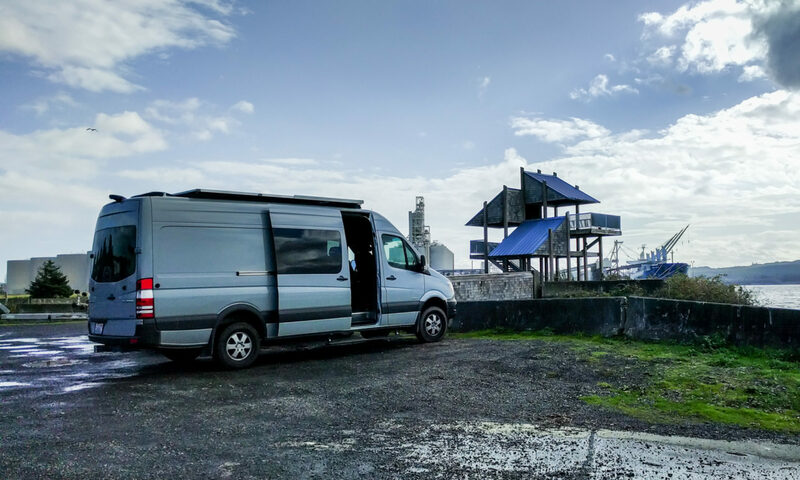 You can open the doors 90 degrees and have a well-lit work area at the back of the van. Or, you can open a door 270 degrees and light whatever is on that side of the van. Glad you like the site. I’m not sure what the part number is either. I looked quickly on genuinemercedesparts.com and the closest I could find is 0039975586 Door Shell Plug but I don’t know for sure if that’s the correct part or not. I’m assuming the number isn’t on your existing parts? You might have to go to a dealer for this one. First thing is thank you for all this wonderful information! I’ve been trying to find what people do with the stock wiring harness that runs along the edge of the roof and down to the rear doors. Did you guys leave it in place and just insulate and panel around it? Re-route it through the ribs? Thanks again! Zack, we unclipped the wiring harness from the wall, ran our insulation and wall/ceiling panels behind it, then enclosed it in a raceway behind the coving we put in the corners of the ceiling to hold our lights. We ran several other wires from our build in the same raceway. It would be really hard to re-route it through the ribs. You’d have to cut and re-connect every wire in the harness, and that sounded like a very bad idea to us. Great information. Where did the LED work lights come from? Thanks. Greg, the LED work lights came from Amazon. The exact ones I ordered are not available any more, but these look identical and are super-cheap. There’s more information on these lights on this page on the site.